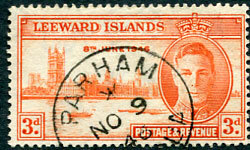 part strike with year "29" showing full office name on KGV 1d (SG.63), very rare office. 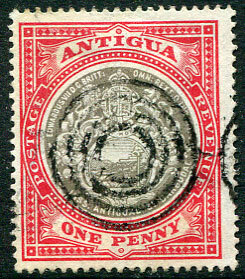 */NO 18 47 on KG6 1½d (SG.100) piece. on horiz. 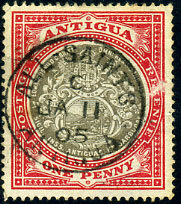 pair 2½d Badge (SG.34). */MY 3 06 on 2d Badge (SG.33). 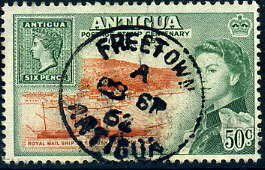 dated 13 FEB 1952 on KG6 1½d, 2d piece. 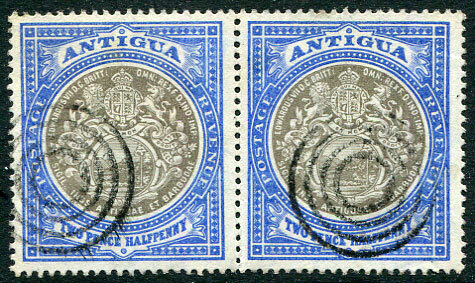 on 1876 QV 6d blue-green CC wmk (SG.18). with YEAR ERROR dated A/AP 28 28 on QV 1d (difficult to determine whether CC or CA wmk). 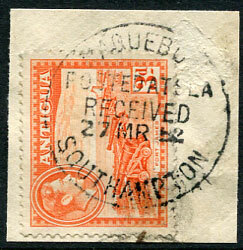 C/MR 26 31 on KGV 1½d (SG.69) piece. 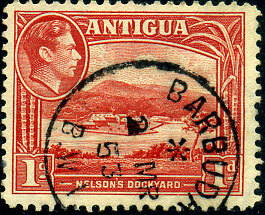 */JU 16 -- (without year) on 1921 KGV 2½d Mult. Script wmk (SG.71). 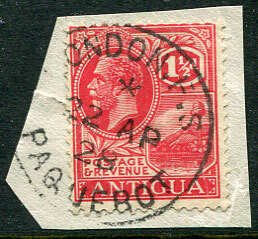 dated 22 MR 53 on KG6 3d (SG.103) piece, some surface abrasion. 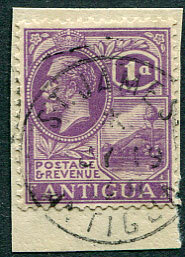 */JY 19 28 on KGV 1d mauve (SG.64a) piece. 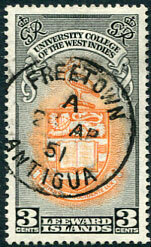 The newly published handbook on Antigua by Freeland & Jordan gives the earliest and latest recorded dates for St. James as */JY 19 28 to */FE 18 29 (a mere 7 months). The */FE 18 29 strike was recorded as the only known dated example and it is illustrated in the new handbook but seems to be partly enhanced in black ink. 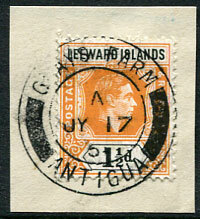 It is currently believed that this */JY 19 28 example is the finest copy. 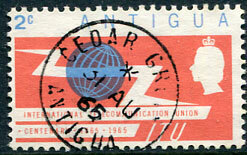 */31 AU 66 on QE2 2c ITU (SG.166). 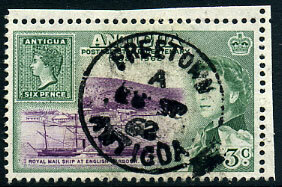 used Foreign Section dated */22 AP 28 on KGV 1½d (SG.68) piece. C/JA 11 05 on 1d Badge (SG.32), facial scuff. 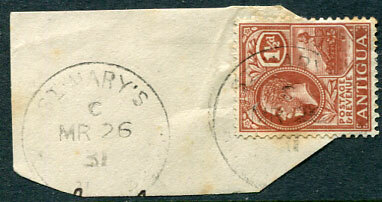 on 1863-67 QV 6d dark green sideways star wmk (SG.9). 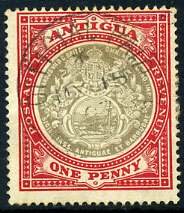 on provisionally supplied Antigua QV 1d carmine-red (SG.26). Cat.£130.00. 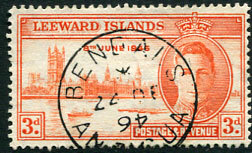 A/28 SP 62 on QE2 3c (SG.142). A/28 SP 62 on QE2 10c (SG.143). A/28 SP 62 on QE2 12c (SG.144). A/28 SP 62 on QE2 50c (SG.145). 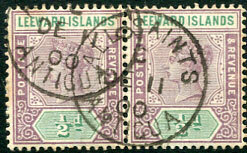 */5 FE 33 on KGV 1/- (SG.57), early strikes very rare. 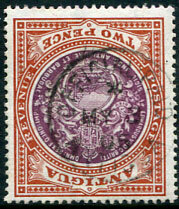 on 1884 QV 1d carmine-red CA wmk (SG.25). on QV 6d green upright small star wmk (SG.8a, Cat.£160). 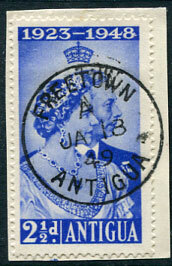 on QV 6d green sideways small star wmk (SG.8, Cat.£26). 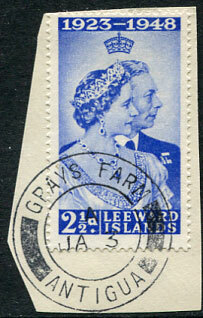 */FE 27 37 on KGV 1½d (SG.69). 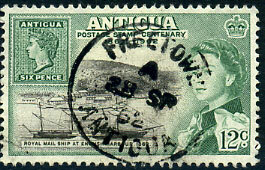 */14 SP 35 on KGV 2½d (SG.71). */MY 15 07 (ERD) on 1d Badge CC wmk (SG.32). 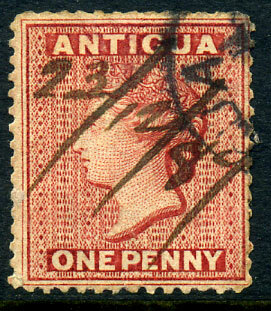 on 1876 QV 1d lake-rose CC wmk P.14 (SG.17). 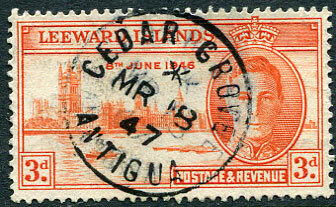 on 1870 REVERSED Crown CC wmk QV 1d lake (SG.13x) showing French Paid Destination mark. 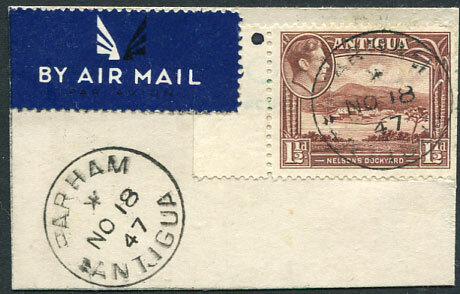 arrival dated A/PENRYN/AU 28 72 on QV 1d vermilion sideways star wmk (SG.7b) pmk'd light "A02", straight edge at top and small frontal surface fault at base. 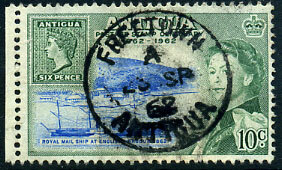 arrival Foreign Section */3 AU 33 on KGV 1½d (SG.69). 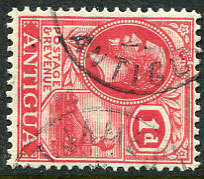 village manuscript date written in a bold style on QV 1d carmine-red CA wmk (SG.25 overstruck partial ANTIGUA cds at St. Johns.